Filter by State and Country, and then the list is alphabetical by City. If you don't see your state listed, we don't have an outlet there at this time. Unless otherwise noted, these outlets carry a variety of Herb Lore products but do not necessarily carry the entire Herb Lore line. You may want to call first to see if they carry the item that you're interested in. 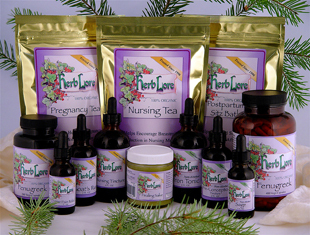 If you have a favorite store that you would like to have carry Herb Lore products, please mention it to the store owner or herb buyer and contact us. We will make contact with them and see if we can make it happen for you! Sells Herb Lore products as well as Young Living Essential Oils. Knowledgeable about what's safe and appropriate for pregnancy and breastfeeding, and ways to have a green and non-toxic home. Shipping within the US available, or items can be picked up locally at the address given. Family-centered, home-based maternity care with Certified Professional Midwives. Homebirth, Birth Center Birth, water birth, pregnancy care to 6 weeks postpartum. Serving Southeast Idaho. Serving families in person in the Portland, OR area, and families nationally/internationally via Skype and email as needed. Luna Lactation & Wellness is committed to providing personalized, comprehensive support for all phases of lactation and beyond. We view lactation as a holistic process and respect each family’s unique health care beliefs. We strive to provide nurturing, clinical care so that each family can define their own feeding and wellness goals. Eunice Salinas, Natural Fertility Specialist, Traditional Natural Healer Practitioner. Our services include high quality supplements such herbal tinctures, homeopathic, teas, infusions, lotions, therapeutic grade essential oils , Fertility Massage, Maya Massage, Womb Wrap Detox, Fertility Cleanse for the couple, Womb cleanse, self-care fertility massage, personalized natural fertility guide, PCOS, blocked tubes, ovary cyst, fibroids, hormone balance and nutritional support. English - Spanish speaker. By appointment only: (832) 366-1106 cell or (972) 982-2967 office. Leah Ortiz is a Board Certified Complementary & Alternative He alth Practitioner, Licensed Massage Therapist having completed education in other complementary and alternative modalities such The Arvigo Techniques of Maya Abdominal Massage and Certified Fertility Massage, tested nutritional supplements, reflexology and Iridiologyst basic medical sciences and related topics. Since 2013 Leah has been successfully helping couples dealing with PCOS, Endometriosis, Sperm Issues, recurring miscarriages and other fertility challenges. The education you received during a consultation does not include the diagnosis and treatment of disease following the standards of medical profession. Leah is not a licensed medical practitioner in any capacity in the State of Texas, and her services do not replace those of a licensed physician. Clients are advised to seek the advice of a licensed health provider for any illness or persistent symptoms..